I love using quinoa (pronounced “keen-wah”) because it’s a great vegetarian option that’s packed with protein and nutrients. It’s also a nice break from the usual rice or couscous and now a days they have so many different varieties of it that you can try all kinds of different options. In a couple of weeks our farmer’s market goes from open every day to just one day a week so we’ve been taking advantage of just about everything we can get our hands on, including these beautiful red bell peppers. 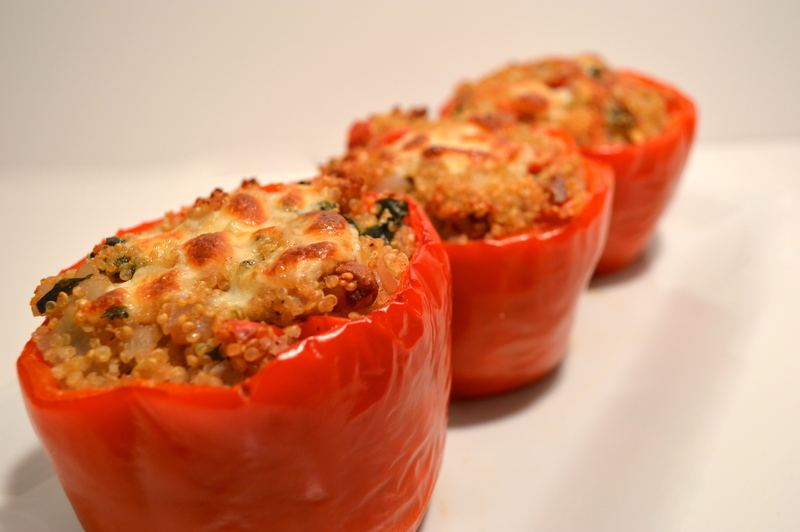 They’re stuffed with a mix of fresh onion, bell peppers, garlic, cloves, quinoa and parsley. The most flavorful part comes from the delicious nutty notes of provolone cheese and walnuts. They are baked until the peppers are softened and the inside is gooey and perfect, making these a real treat for dinner. Start off by preheating your oven to 450 degrees and position a rack in the top third. While picking your 4 red bell peppers, try to choose ones that stand up easily on their own (If you wan’t, slice a very thin layer off of the bottom on each one to help them stand flat). Slice off the tops just below the stem and remove the ribs and seeds from the insides. 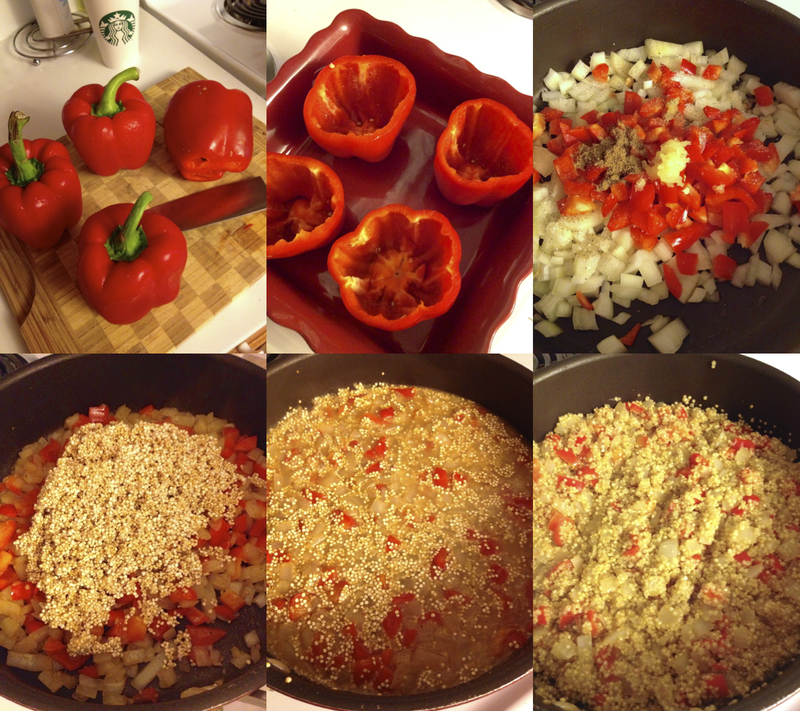 Place the cleaned peppers in an 8″ x 8″ baking dish,chop up the remaining tops and set aside. Heat 1 tbsp extra virgin olive oil in a high sided skillet over medium heat. Add in 1 medium onion that’s finely chopped, 2 garlic cloves that are minced, 1 tsp ground coriander and the chopped pepper tops. Stir well to coat with the oil, season with salt and pepper and cook for 5 minutes until softened. Add in 1 cup quinoa that’s been rinsed and cook, stirring, until fragrant (about 1 minute). Add 1 cup water and bring to a boil. Reduce to a simmer, cover the pan and cook until the water has been absorbed and the quinoa is tender, about 13 minutes. Remove from the heat. Stir in 1/2 cup flat leaf parsley leaves, 1/3 cup walnuts chopped coarsely and about 3 ounces of provolone cheese. We had slices leftover from sandwiches earlier in the week so I just cubed a few slices of those. Divide the filling evenly among the 4 peppers and cover the baking dish with parchment first and then a layer of tin foil. Bake for 1 hour, remove the foil and parchment, top the peppers with a little more provolone cheese and bake for about 10-15 minutes more. Mmm – these look delicious! Wow that’s really beautifully red! Bet it tastes wonderful too. I’m not a big fan of cooked peppers, but I would definitely try this with tomatoes. Yummy looking though. Would be fantastic in tomatoes!